Choudhary Raghvendra singh - Founder of DLF Limited or DLF (Delhi Land and Finance) in year 1946 in NCR Region with vision to provide homes to millions. 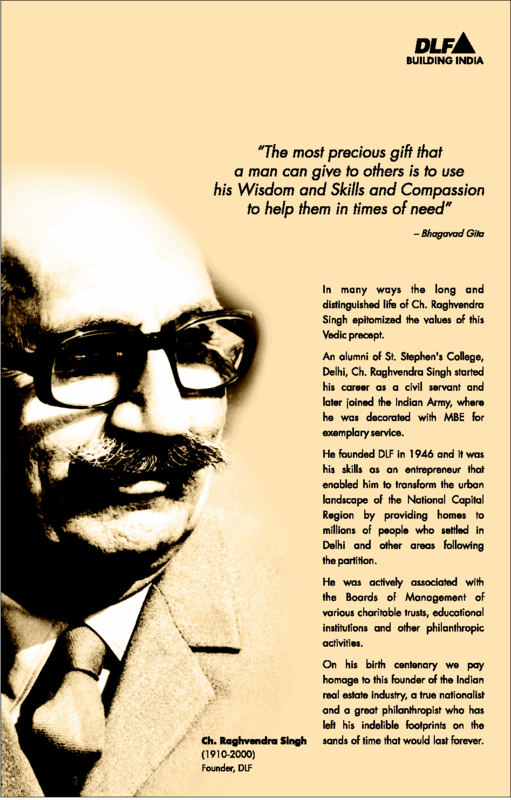 Choudhary Raghvendra singh was born in year 2010 and this year DLF group celebrates his Birth centenary. DLF developed residential colonies in Delhi such as Shivaji Park ( which was actually its first one), Rajouri Garden, Krishna Nagar, South Extension, Greater Kailash, Kailash Colony and Hauz Khas. In 1957, with the passage of Delhi Development Act, the local government assumed control of real estate development in Delhi and banned private real estate developers. An alumni of St. Stephen’s College, Delhi, Ch. Raghvendra Singh started his career as a civil servant and later joined the Indian Army, where he was decorated with MBE (Member of British Empire) for exemplary service. He founded DLF in 1946 and it was his skills as an entrepreneur that enabled him to transform the urban landscape of the National Capital Region by providing homes to millions of people who settled in Delhi and other areas following the partition. He was actively associated with the Boards of Management of various charitable trusts, educational institutions and other philanthropic activities. The date of birth of Ch. Raghvender Singh of DLF founder is wrongly mentioned as 2010. Please correct the same & also mention the gotra of Sh. Singh. The date of birth of Ch. Raghvender Singh of DLF founder is wrongly mentioned as 2010. Please correct it. Correcting all Esteemed Gentlemen, Chaudhary Raghvendra Singh was the Eldest Son of Late Chaudhary Lal Chand Phougat of Vill.Bhalaut Distt Rohtak, Haryana. His father was a renowned politician and was contemporary of Sir Chotu Ram.